Creativity comes in many forms and combinations when you see it out in the world. While it can make for a tricky definition, it also allows for great self-expression, no matter what mediums or what combinations you want to use. A great option for the perfect blend of unique is the combination of a creative work and photography. In fact, there are some great reasons as to why this is a great option for you and your project. We’ve put together the top 5 reasons to use photography so that you can see its perks for yourself. A digital photography workstation with a modern digital DSLR camera, laptop computer and display. Image from welcomia, 123RF. There are some places and situations where an illustration is going to be the right call, there’s no question. However, there are going to be more times than not that a photo is going to be much more authentic and appropriate. There’s a certain accuracy to photography that is going to be more captivating in terms of its authenticity. Just think about books shopping. Outside of the children’s section, a majority of the books have photos in places of illustrations on their covers. This is because it’s realistic and authentic and helps provide this authenticity to the viewer. When a viewer is taking a look at your piece and it’s side by side with a similar piece that uses an illustration or other creative effects, your photography (assuming it’s the right use!) is going to help the viewer connect with what they’re seeing. Photography shows us the world that we already know, but introduces us to a unique version or view of it. The viewer is familiar with our real world, so the photography is going to be great for helping the viewer connect to what you are sharing it the photo as the leading element. 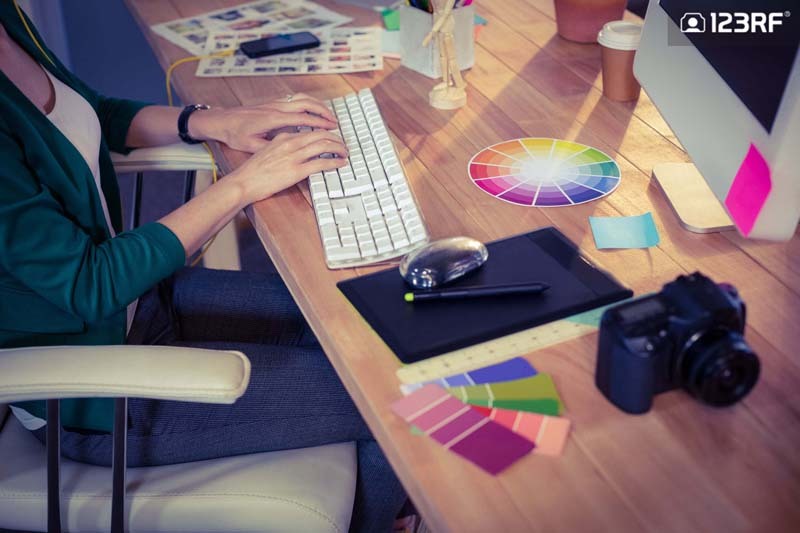 A designer working at her desk in a creative office – Image from Wavebreak Media, 123RF. When it comes to actually helping the viewer get into the creative work that you’ve provided, photography is going to draw them in. It will compel the viewer to pick up the book (to keep using our previous example) and take a look at what it is about. The whole “judge a book by its cover” thing is the point, here. Make the viewer want to engage with what you’re doing and then, with this simple photo, draw the viewer directly into the piece without them realizing that they’ve been sucked in. That’s how you know it has been done correctly. In looking at the photography that you choose, a viewer is going to be feeling one of three things: bored, interested, or inspired. The latter two are the ones you should be aiming for, naturally, and the third option is the ideal one. When it’s applied correctly to your creative project, photography can stir enthusiasm and inspire minds to go further than your creative piece. Sometimes it’s about helping them see that your effect is possible when you have the right tools. Used properly, photography is going to instill hope and inspiration in your viewer the longer that s/he looks at it. This is perfect for ensuring that you get the right effect. The simple fact is that an illustration won’t be able to give that overall effect that a crisp and realistic photo can do. A photo is going to make your creative work much more memorable for your viewer, as it gives them something to look at and focus on even in their memory. Maybe it’ll be the effect, maybe it’ll be the haunting angle of the photo, or maybe it’ll be the perfect connection in how it ties into your creative work. You may not be able to predict quite how the viewer is going to remember your piece, but photography is going to help ensure that it is, in fact, memorable. When you have a creative piece that is fantastic, combining it with photography is going to help give you a boost in making it a complete experience. 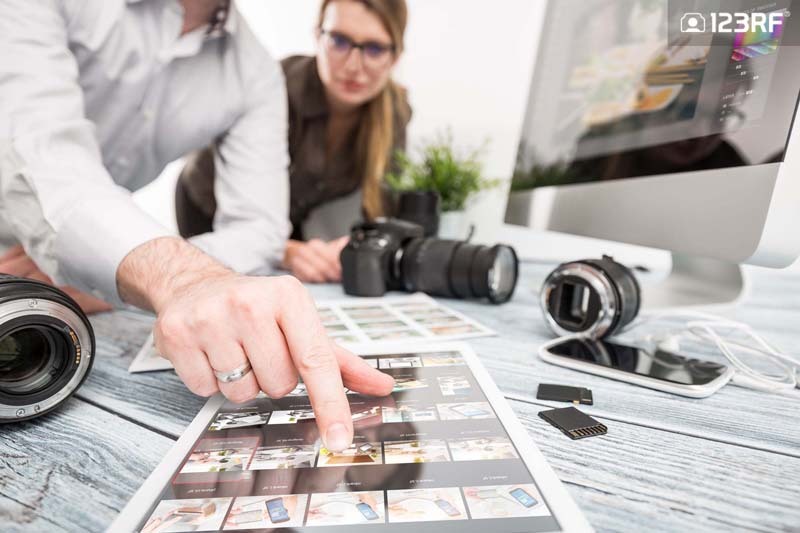 Just like how a title properly (or, should) finishes and summarizes a novel’s contents, a photo is going to help perfect, finish, and summarize the content of a creative project. It ties it all up in a neat little bow and makes it an impressive piece from edge to edge. 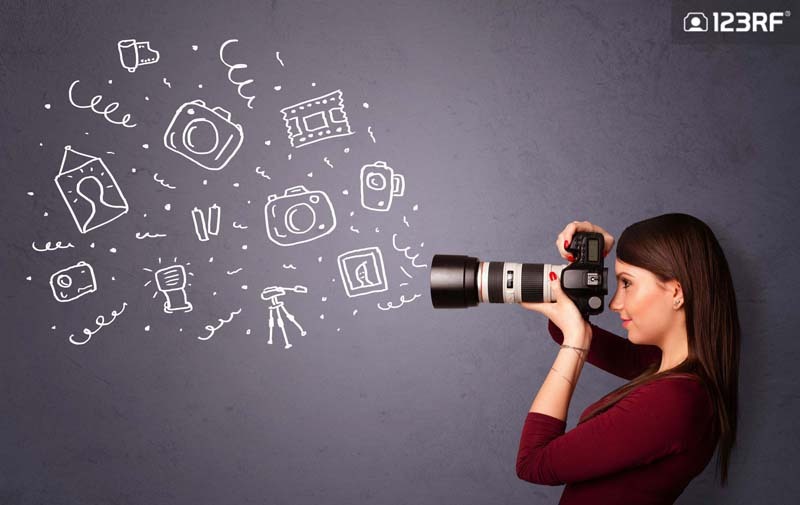 Young female photographer – Image from Rancz Andrei, 123RF. Your creative work is something that you’ve been working on for a long time and you want to make sure that its final effect is what you had planned, or some variation on it. 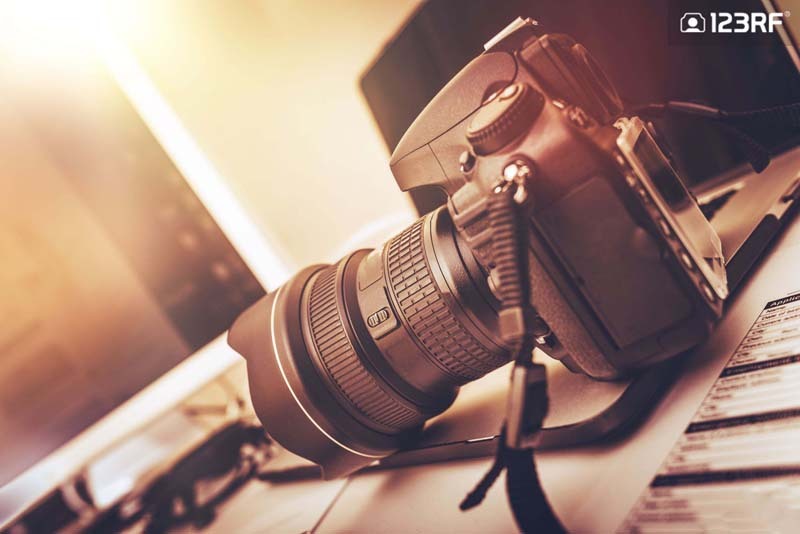 When it comes to reasons to use photography in your work, you can’t skip the important factor that it’s simply going to make a difference and a positive one. As humans, we’re fickle creatures that have high standards when it comes to a full project. We want to be moved and connect to a piece entirely. 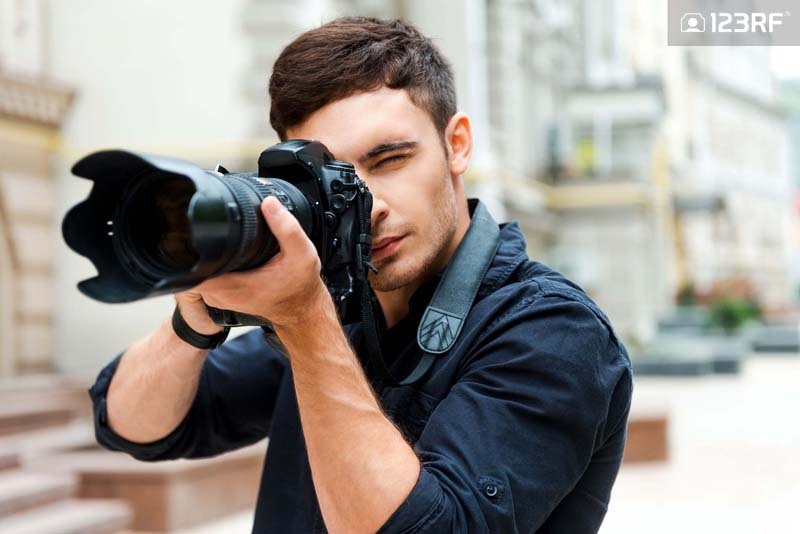 You can help guarantee that by using photography in the process. The viewer will, essentially, become part of the piece and see its worth and impact easily. The whole point of your creative work is to bring out the proper emotional reactions to your piece. You’ll be able to give the viewer a chance to feel what you want them to feel and encourage them to share those feelings with other viewers. This creates a sentimental community that is going to help you see just how successful your piece can be. As mentioned, you want to make sure that you’ve got all of your ducks in a row, and the right photo selection is going to help finish off your piece and make sure that it is ready to present to the viewer you wants to connect and be inspired by all that you have to offer in your piece. Designer team discussing photos on a tablet – Image from scyther5, 123RF. You’ve worked hard on the creative work and the time has come, now, to focus on making sure that you get that important message out to the viewers that are waiting for you. This is where the photography comes into play, so use it wisely and you’ll find that you can get the right final effect that you’re going for without even trying. That is, after all, how you know it’s going to be done right. Trust your creative gut and it’ll lead you to the right pieces of photography that will further your creative project and bring the viewer inside to where the deeper message lies in wait. For more inspiration, check out our 10 techniques to stay creative, or read about 5 free design resources for all your creative needs.